Ski & Snowboard Injury Prevention: the top 4 things to add to your pre-season training, from our October workshop. For those of you who attended our ski & snowboard workshop in October, thank you! We are so glad we get to share our knowledge with our community. For those of you who missed it, here is a recap from skier Jenny Ploss, PT, DPT and from snowboarders Nate Vigil, PT, DPT and Julie Holt, ATC, LAT, MCT, ITAT. We spent an hour and a half a few weeks ago talking about common ski and snowboard injuries and the most important things to do to prevent injury at our October free community workshop. We all know, theoretically, that we should train for ski and snowboard season. But what are the things you should include in your workouts to help reduce your risk of injury? We’ve chosen the top 4 components of a training program below, based on injury research and our physical therapy experience. 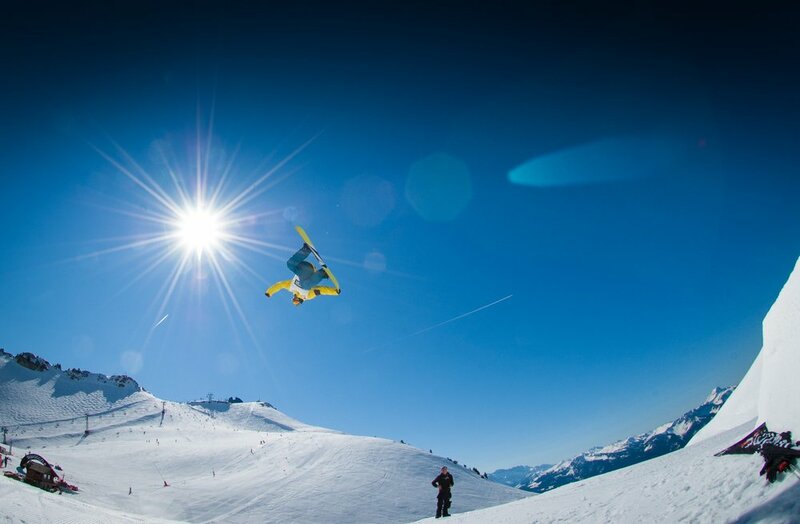 Most injuries occur at the lower leg (knee and ankle) and the arm (wrist and shoulder) for both skiing and snowboarding. Skiers are more likely to injure knees, while snowboarders are more likely to injure wrists. Some of the injury prevention things we mentioned included protective gear (helmets, gloves with wrist guards for snowboarding, and ski poles with releasable straps). But a lot of what we talked about involved how controlled you can be on the mountain, how long you can ski or snowboard before you get fatigued, and how well you respond to potential falls. Most falls happen when you are new to skiing or boarding or when you are fatigued. This serves as your excuse to stop early and get a warm drink instead of pushing through to the end of the day, especially early in the season, when your body is unaccustomed to the rigors of skiing and snowboarding. Another way to reduce your risk of injury due to fatigue is to train during pre-season so that you have better strength and endurance when you get on the slopes. The last thing we talked about was falling. The way you fall can have a huge impact on whether or not you get hurt, and we will devote an entire blog soon to the art of falling. We all know, ideally, that we should be working on strength prior to ski season. But what strength work is the most beneficial? We think lower body strength work that emphasizes high reps and lower loads is the best thing to do to mimic the demands of a day in the mountains. Dr. Nate Vigil took us through a series of strength exercises which were designed to turn on your gluts and they are meant to be held long enough to feel a burn (60 seconds never felt so long!). Start doing these today, in addition to the other strength work you do, and your legs should last a little longer on your first few days out! To some, this sounds intense, but it doesn’t have to be. Yes, if you are taking jumps when skiing, you should practice jumping prior to doing that. But even if you don’t jump on skis, our MovNat jumping progressions are built to help you get the endurance and power you need to ski or snowboard with control all day long. Here is a list of the components of a jump that you can add today (make sure you consult with your PT or doctor first, of course!). Heel raises: this is especially important for snowboarders, but skiers use the muscles of our lower legs too (even if they’re locked into rigid boots). Plus, if you’re going to build up to jumping, you need to be able to lower your heels to the ground with control. Squats: you knew we would get to this, didn’t you? You were right—the squat is an essential component of a jump, and the thing we do 80% of the time while skiing or snowboarding. So get squatting! Make sure your knees are in line with your toes (not falling in toward each other), and that the movement is controlled. Hops: not all jumping needs to be intense. We hop all the time in our Bone Health class, and I promise, people’s knees and backs handle it well. We make sure to prep well, and to control our hops with our muscles, rather than letting our bones and joints take all the force of landing. Hops are great for agility too—you can hop forward and backward, sideways, on one or two legs, on soft ground or on harder ground. Jumping: OK, once you’ve prepared with the above movements, let’s start going somewhere. You can jump forward, like Julie is doing in the photo below, or you can jump up or down using plyometric boxes. Adding complexity: throw a ball, pick up objects, turn and look around, reach in different directions, and see if you can still stay balanced. Dr. Nate Vigil is writing an article on how to fall well when you are skiing or snowboarding, and he’ll include the most important things to remember for each sport. In the meantime, you can watch a video about how we train for falling using MovNat skills and progressions. Come see level 2 MovNat trainer Jason Ploss take you through a good fall training program. What if you’re already hurt, or can’t do these movements well or without pain? Let us know. We would be happy to help you, through individualized physical therapy or athletic training assessment and guidance, or through MovNat classes or private sessions. Contact us today to get started! Remember, you might not need a referral to see a physical therapist, so call our office today and see how you can get started. Have a wonderful ski season! This blog was written by Jenny Ploss, PT, DPT. Dr. Ploss has been a physical therapist at Langford for 6 years, working with a range of outpatient orthopedic patients after graduating from UNM and receiving a Doctor of Physical Therapy degree. She is actively working toward certification and specialization in orthopedic manual therapy, especially of the hand, elbow and shoulder. Dr. Ploss uses MovNat in her physical therapy practice as well as teaching classes at MoveTru.